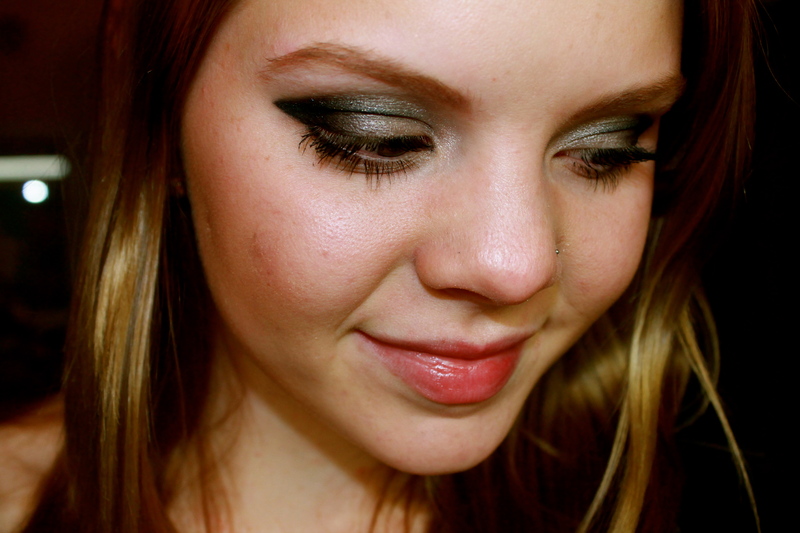 This tutorial isn’t what I wore to class today (sad face, I know), but it’s what I wore last Saturday night! 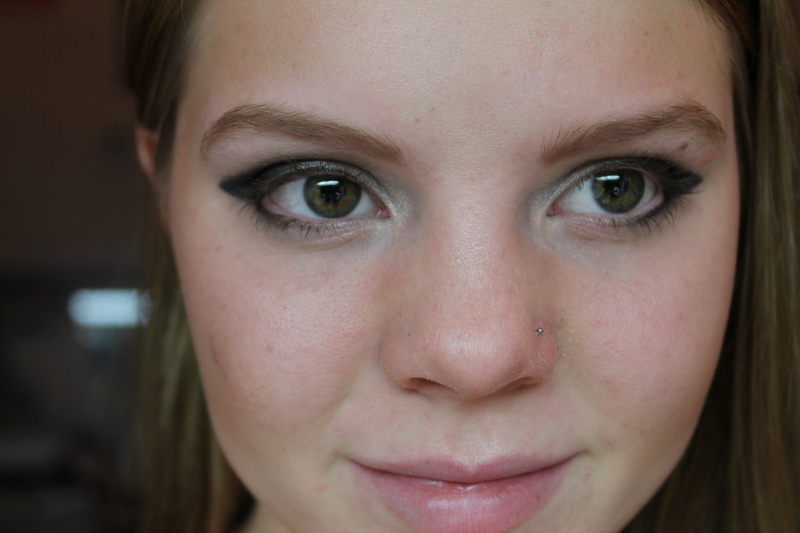 This look is definitely a night look, unless you’re brave enough to dawn it during the day! Regardless-these are the things you’ll need. 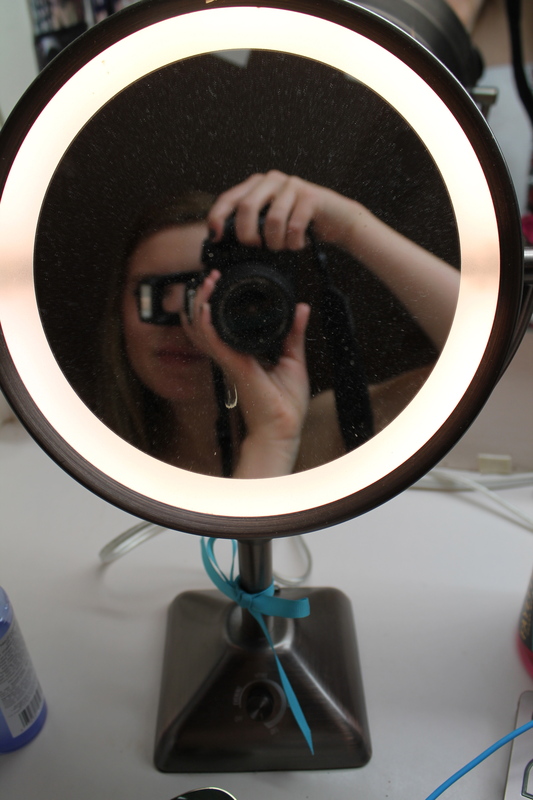 Yes, I posted a picture of my lighted mirror because it really is SO helpful! 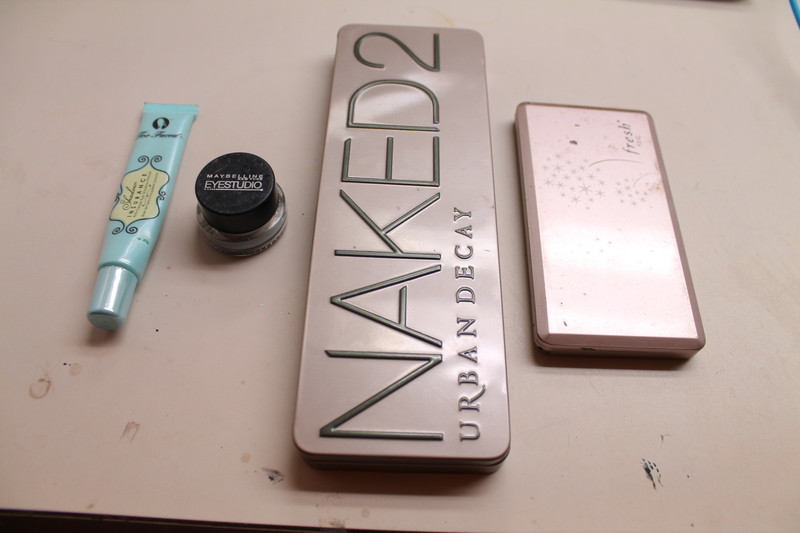 From the left-Too Faced eyeshadow primer, Maybelline Eyestudio liner in black, Naked2 palette, and Fresh shimmer palette. I used Half Baked, Bootycall, the purple-looking beige, Pistol, and Blackout. 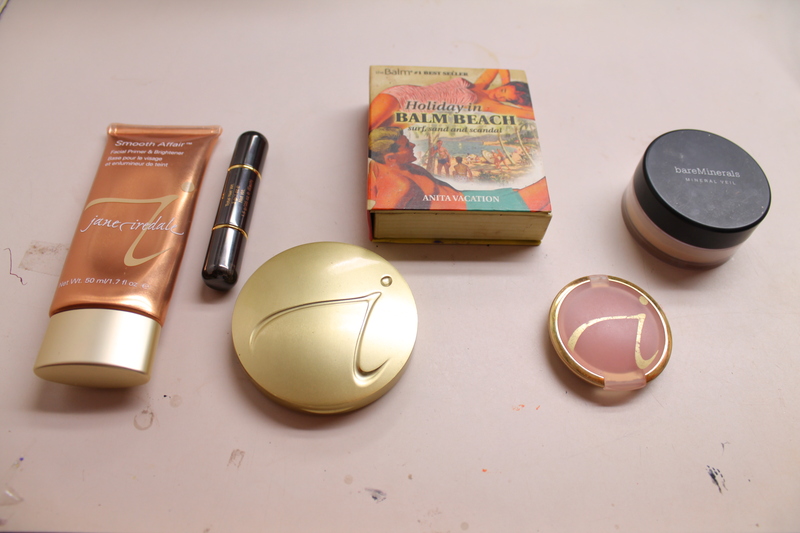 From the left- Jane Iredale makeup primer, Jane Iredale concealer in Z2, Jane Iredale powder foundation, Holiday in Balm beach, Jane Iredale blush, and BareMinerals hydrating setting powder. 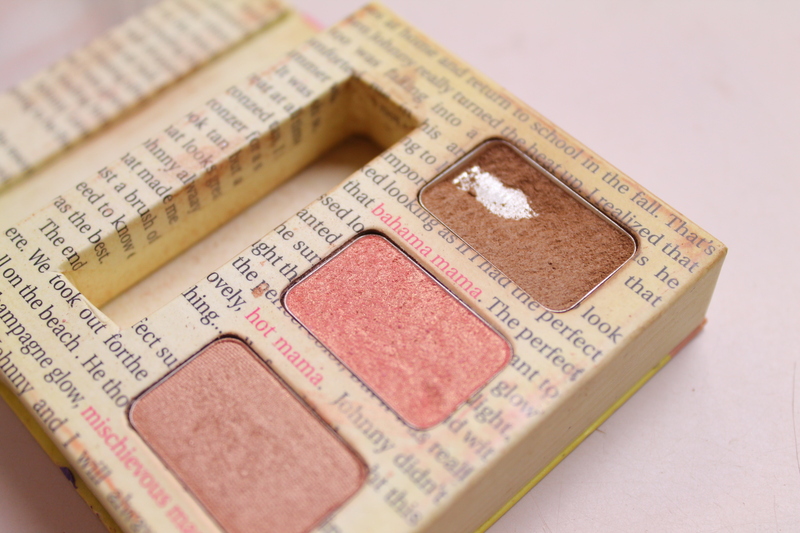 I used the top color from the Baked palette. 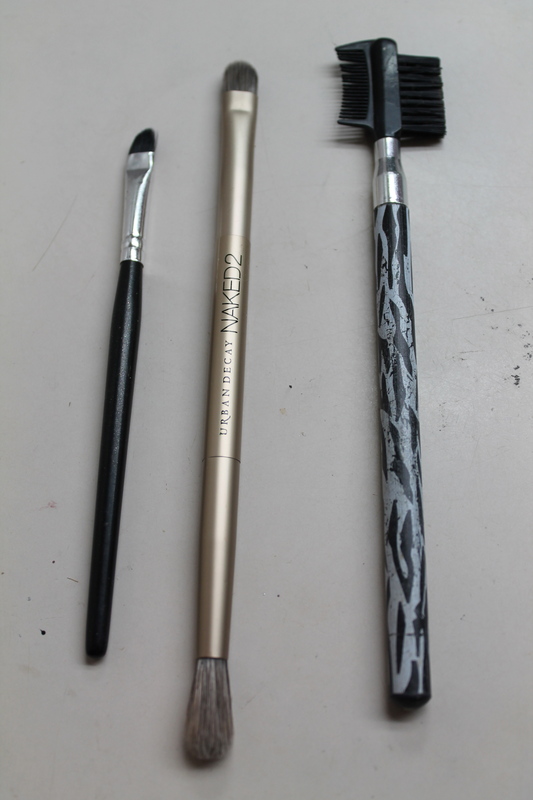 Angled eyelinger brush, thick angled eyeshadow brush, and eyebrow shaper. 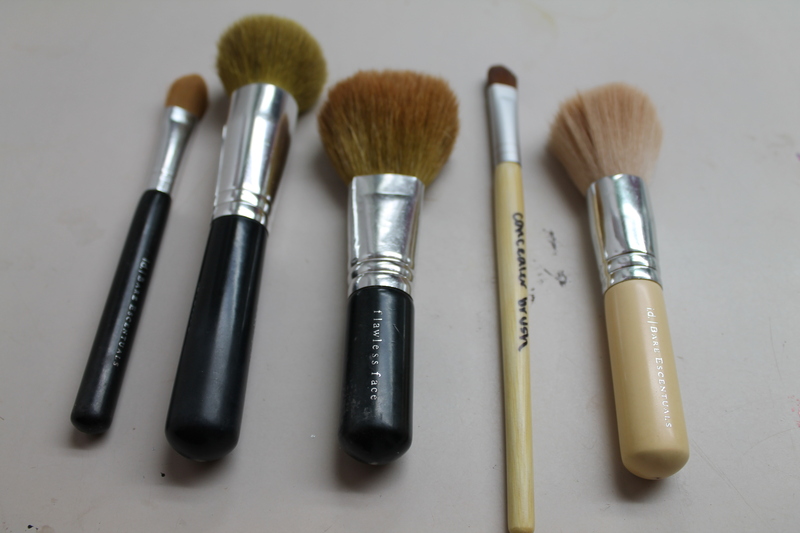 Concealer brush, foundation brush, bronzer brush, highlighter brush, and setting powder brush. Now that all thats been shared, lets get to the good stuff! 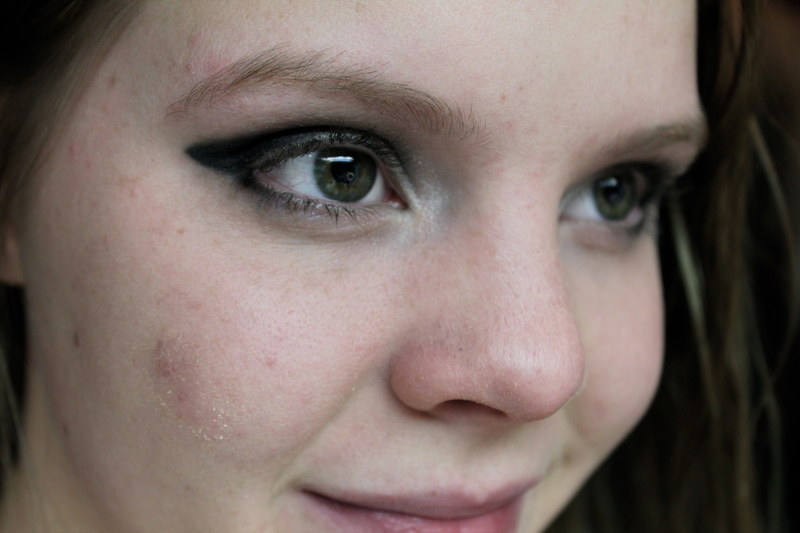 Makeup tip #1-ALWAYS do eye makeup first-if you mess up and spill some powder on your cheek, its easy to just wipe it away or get out the makeup remover without having to worry about taking off your foundation! So, first things first-put on eyeshadow primer!! This will make your shadow literally stay ALL DAY! 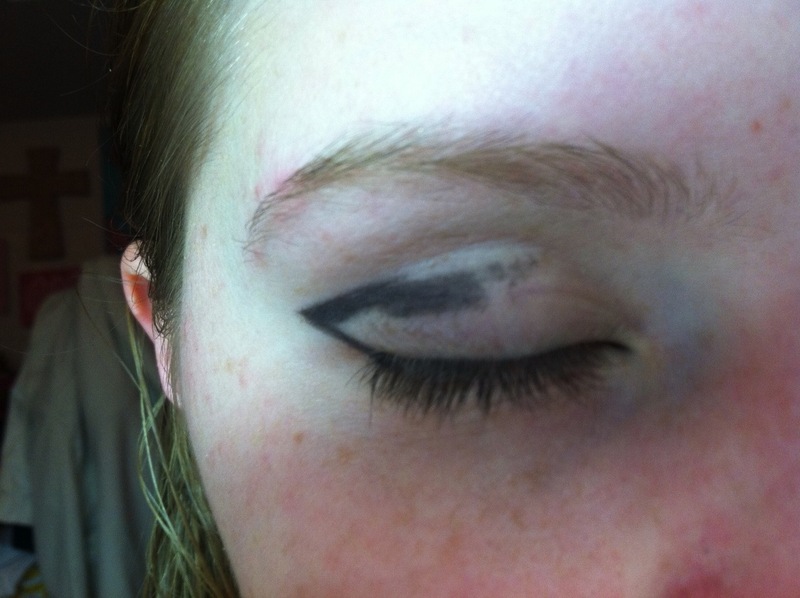 Then, draw on the outline of what you want your cat eye to look like. A good tip is to slightly close your eyes and draw upward until you get to the lid, then draw into the lid. And don’t worry about how terrible this looks right now, TONS of blending will come later! 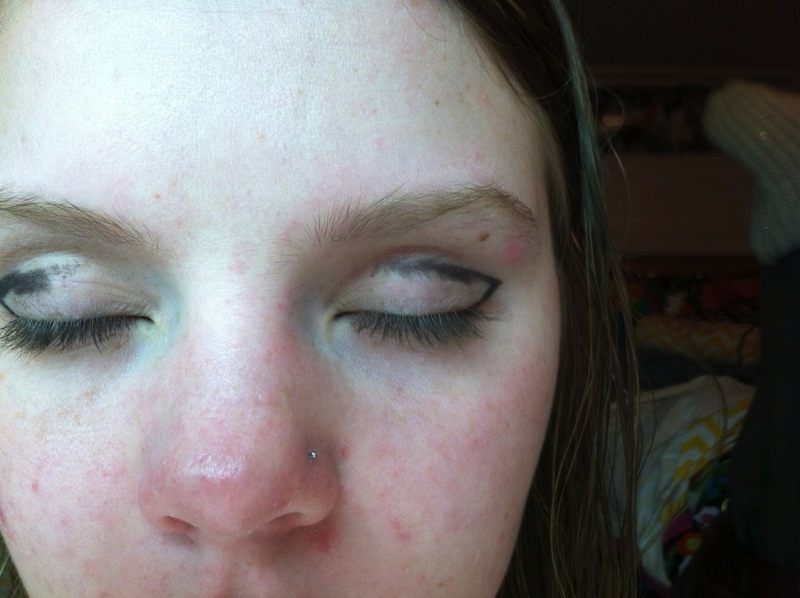 Next, start blending the eyeliner into your eyelid like so, using the angled eyeliner brush. The add a silver color to the inside corners of your eye to make your eyes pop, and put a white/silver color on the center part of your lid and also on top of the silver in the corners of your eyes. DONE! 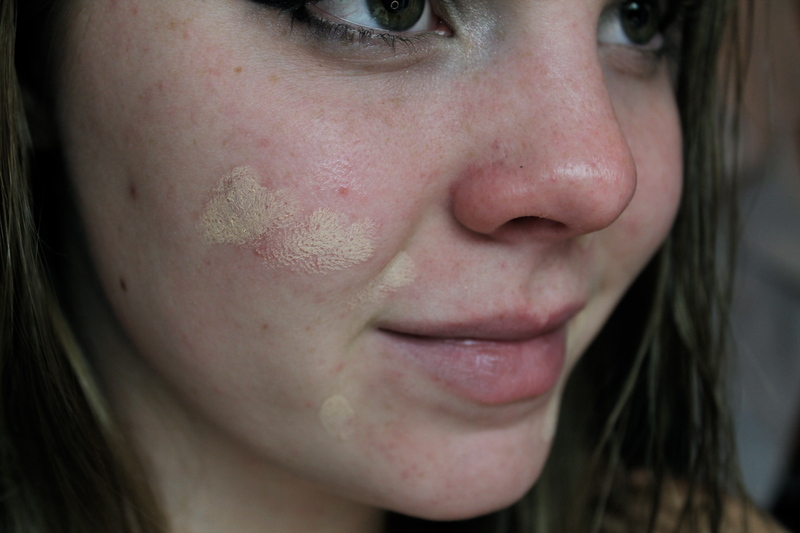 First dap concealer onto blemishes or red spots, and blend by using your fingers and making a downward motion. After the cream concealer is blended, use a concealer brush and pat/blend your foundation on top of the blemish area to keep it concealed. Next is foundation! 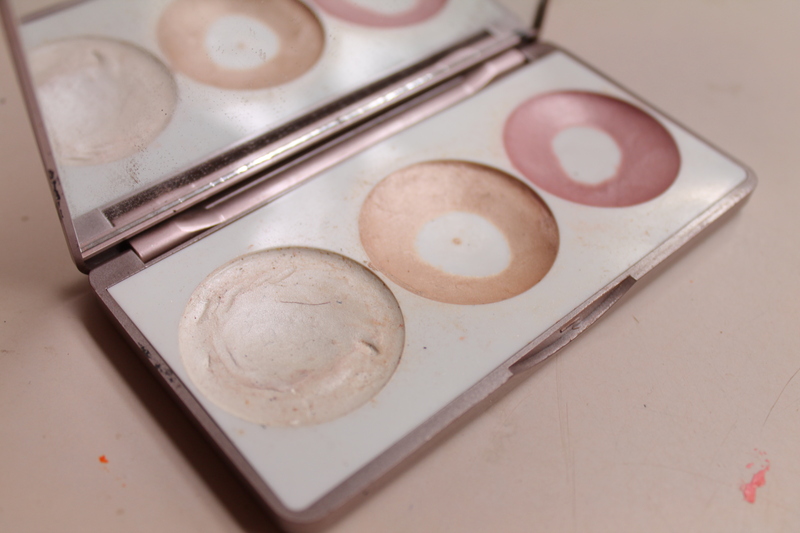 I used Jane Iredal’s pressed powder because I like the light finish it gives my skin. 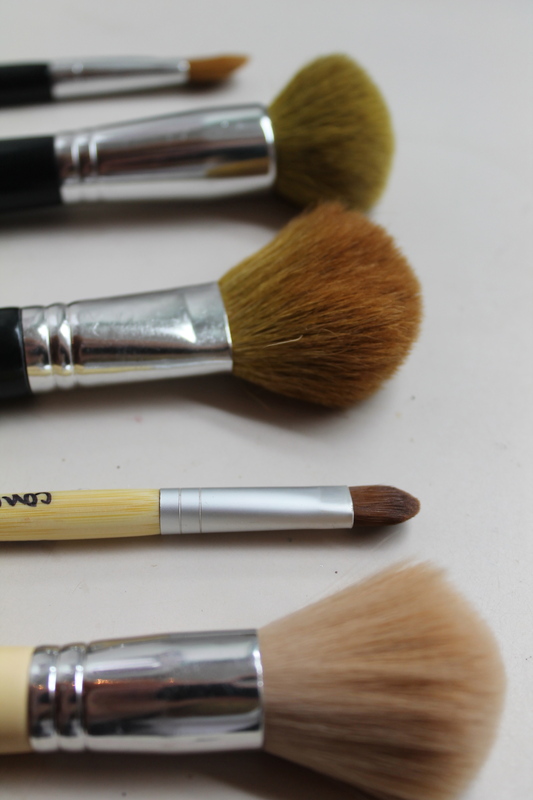 Use a foundation brush and put the foundation ALL over your face, but don’t blend right away. 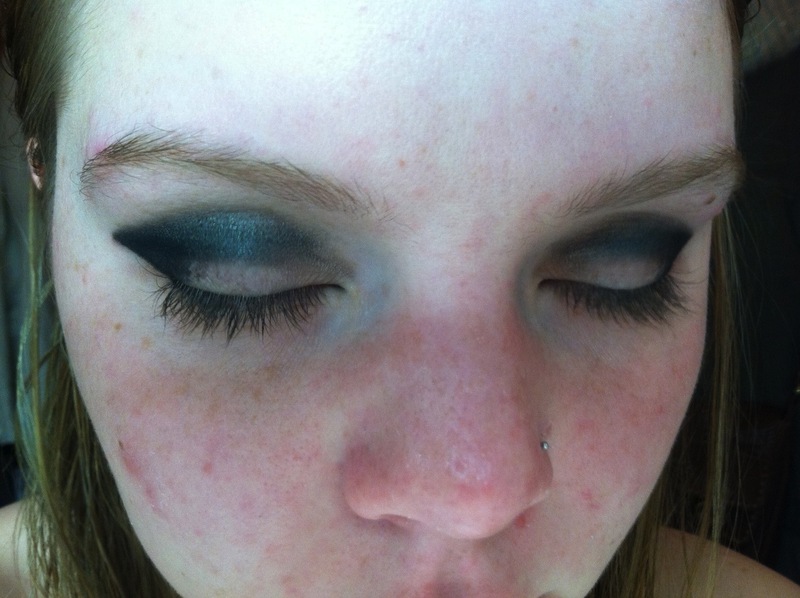 As soon as you think theres powder covering your whole face, blend in a downward motion. I keep saying to blend downward because there’s tiny hairs all over your face that grow downward, and if you blend them down-they stay down and aren’t noticable. 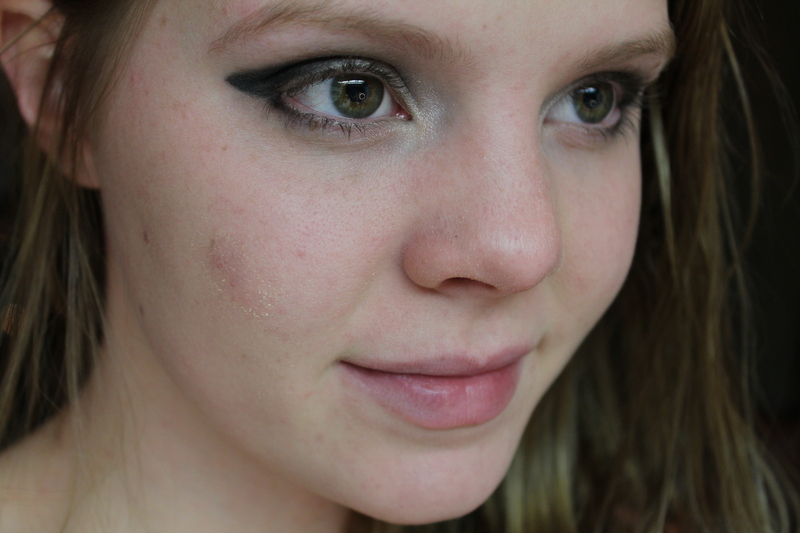 If you blend them upwards and all around, they become noticeable and your face might look uneven. Next comes conturing! This part can get kind of tricky, so I included an extra photo for help if my directions aren’t clear. 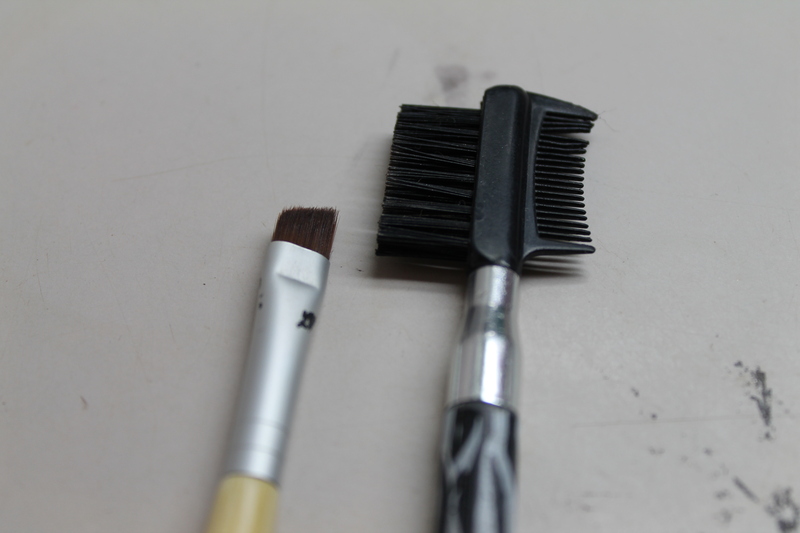 For conturing, I use my bronzer brush and my bronzer (without a lot of sparkle thought-try to find a matte bronzer). Apply your bronzer first in the hallows of your cheekbones, then right about the outer part of your eyebrows, then right on your jaw line. Conturing is a HUGE step a lot of people miss, but it really does make the biggest difference in looking good-and looking freakin fantastic! Think about it-foundation creates a solid blank canvas on your face, with the same color all over. 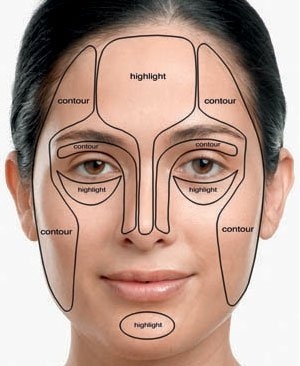 Conturing adds the color back to your face and it defines cheekbones (making us look skinnier-PLUS!) SO DONT skip this! After conturing, I usually add some color and definition to my eyebrows(They’re naturally super light without a specific shape!) 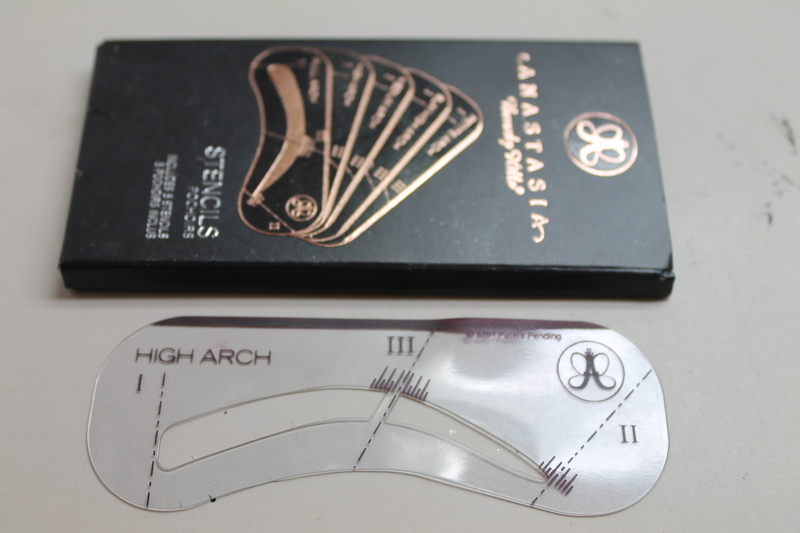 For this, I trace my brows with Anastasia’s brow kit. This makes it super easy to find the right shape for you without looking clown-scary. If you don’t have a brow shaping kit-here’s some easy tips for filling in brows and making them have fuller shape. 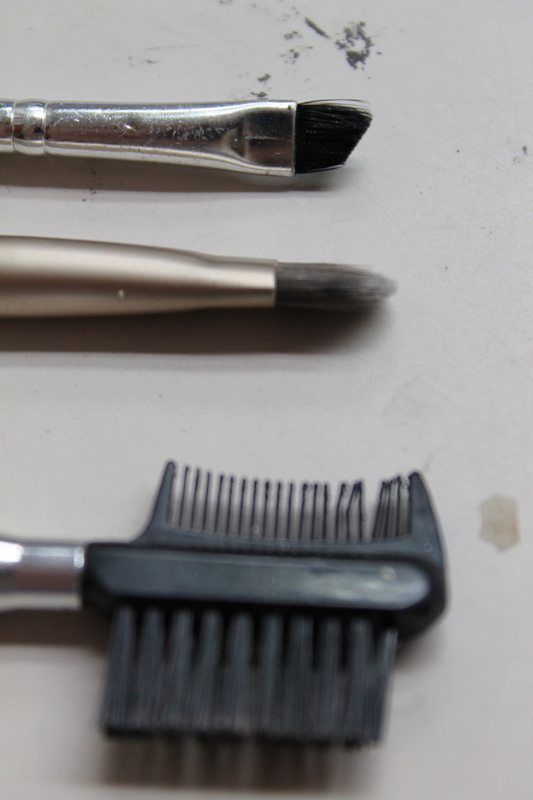 Use an angled brow brush with an eyeshadow color slightly lighter than your eyebrows. But first things first!-DO NOT FORGET EYESHADOW PRIMER!! 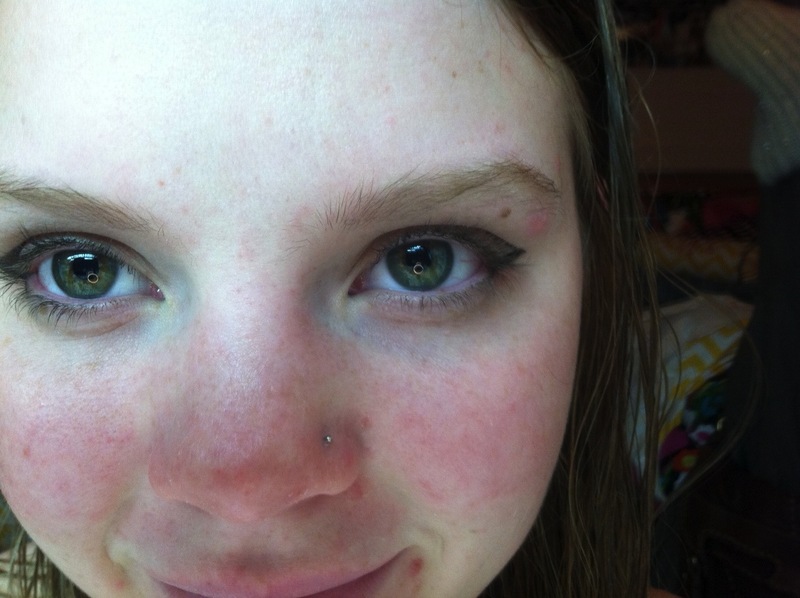 What’s more awkward than thinking your makeup looks so fab than to find out one of your eyebrows has been wiped away?? Well ladies, I don’t think anything IS more awkward! So just use the same primer that you used for your eye-makeup. 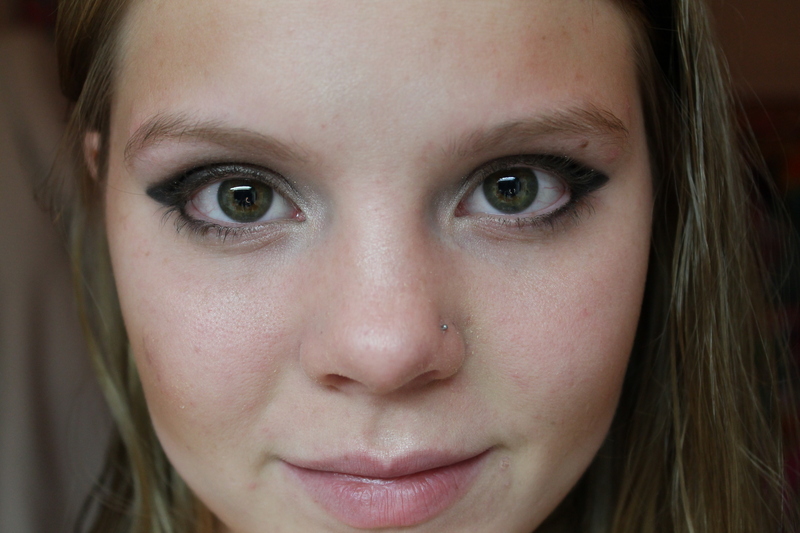 So to fill in the brows-scrunch your face to make a “mad face”. this will make your brows into a straight line on top. Trace this line and fill in on the way. Then do the bottom part of the brows the same way. Bascially follow your natural brow shape with a little definition, because if you make your brows TOO defined they won’t look real! 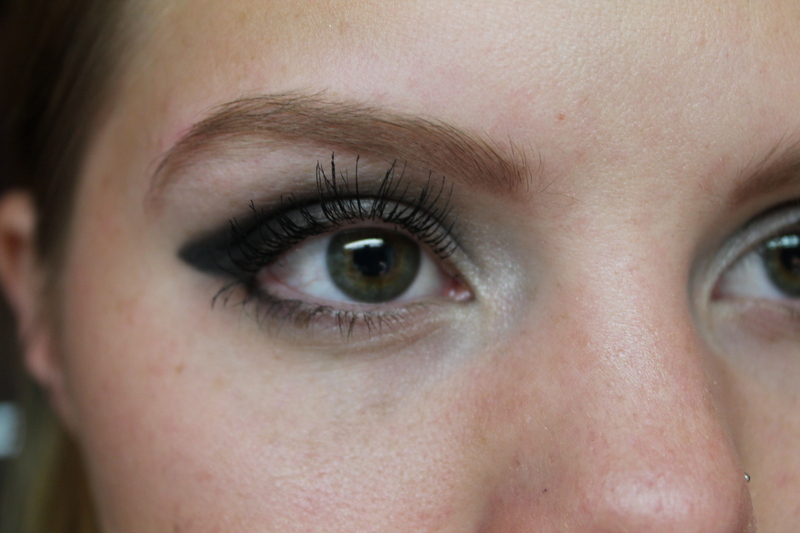 Lastly, if you find your brows are too harsh, simply use one of your fingers to blend the edges, wah-lah! I actually don’t curl my lashes because they’re naturally curly-but I definitely recommend doing so! 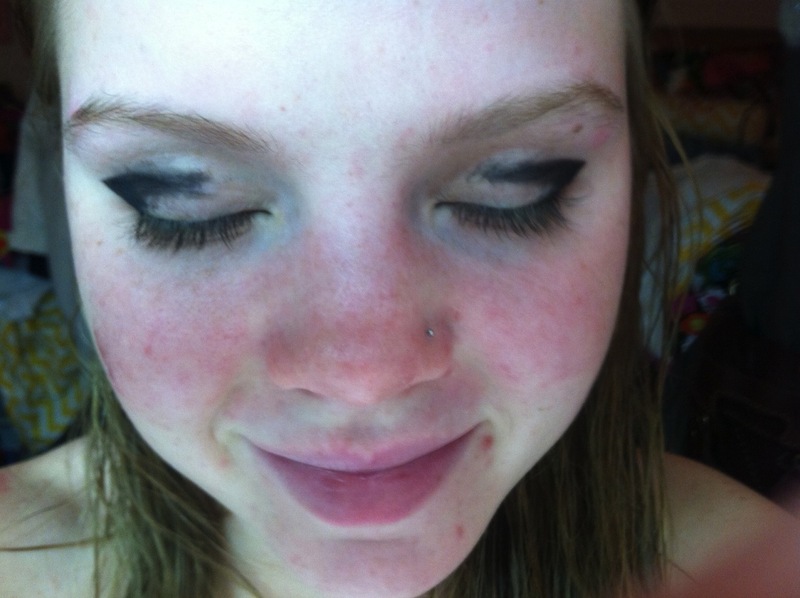 First, use the thickening mascara on the bas of your lashes. This crates volume. Do about 3 coats of this, then move on to the lengthening. 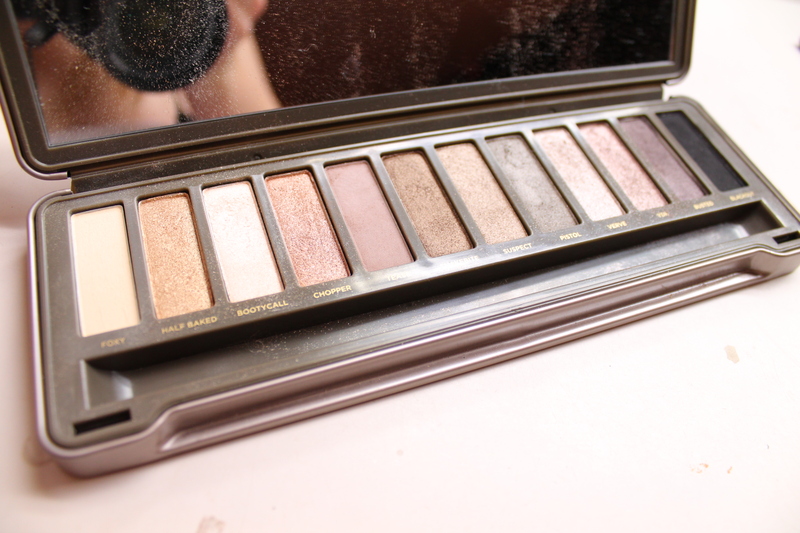 Focus the lengthening mascara on the tips, and do about 2 coats of this. 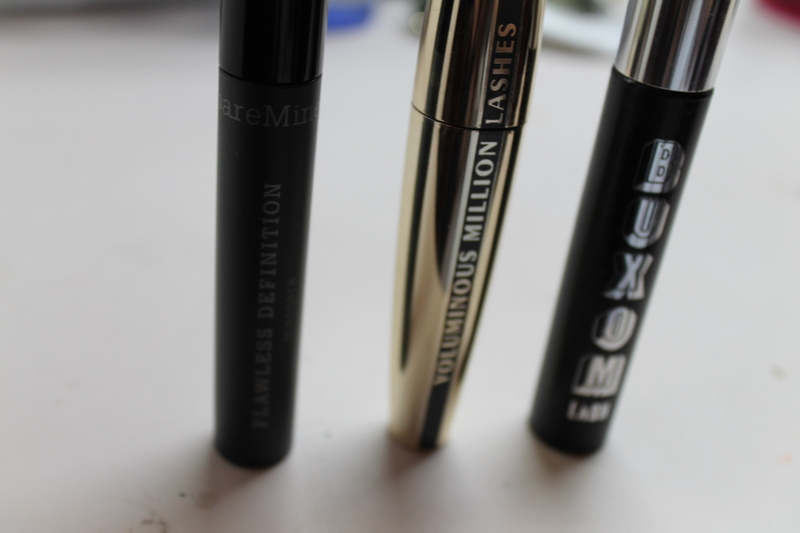 Then blend the 2 mascaras by using the lengthening mascara to go from bottom to top. Just a friendly tip-NEVER curl your eyelashes when there is mascara on them. This leads to serious breakage which you most definitely DO NOT want if your lashes are already on the sort side. 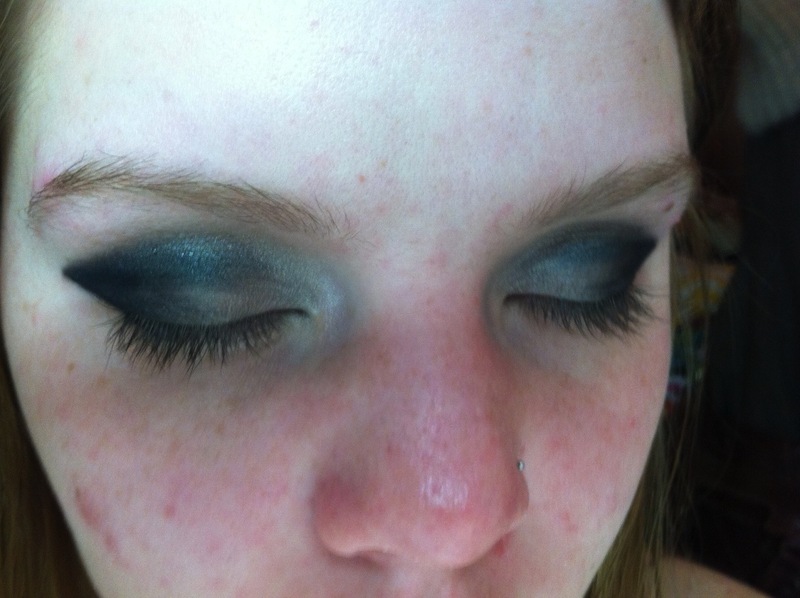 That’s all for the smokey cat eye look! I hope you found this helpful!! If you have any questions or comments feel free to comment or email me! Enjoy the rest of the week pretty gals! Posted on January 22, 2013 by flancake13	This entry was posted in Tutorial Tuesday. Bookmark the permalink. ← Obsessions! the 2-strap sandal.